Hair removal wax temporarily removes hair from the body and facial areas, and the skin stays smooth and free of hair for weeks at a time after waxing. It exfoliates the skin to prevent ingrown hair and offers smooth skin. It also ensures smoother results by boosting skin, supporting cell regeneration, and improving skin tone. Waxing removes dry and dead skin cells along with the unwanted hair. A few waxes available in the market consist of aloe or butter for the purpose of moisturizing. Waxing thus improves the skin texture and makes it more beautiful. As waxing has become more popular, people are looking to ensure they are receiving the highest quality of service. Based on type, the hair removal wax market can be segmented into soft wax and hard wax. Soft wax is used in the strip waxing method, in which a thin layer of warm body wax is spread on the skin and removed with a strip. There are different forms of soft wax such as heated wax, cold wax, and pre-made strips. Wax is typically used for large parts of the body such as arms and legs. Based on soft wax, the heated wax sub-segment holds a major market share as heated wax is most often seen in salons. Wax is heated so that it can be applied to the skin easily and can be pulled off with a strip of paper or cloth, taking the hair out with it. Hard wax is normally used for bikini and Brazilian waxes, as it works well on coarse hair and smaller sections. In terms of value, the hard wax segment is anticipated to reach over US$ 4,000 Mn by 2026. In terms of application, the commercial segment constitutes a significant market share and is anticipated to continue its dominance over the forecast period. The commercial segment (spa and beauty salon) is expected to expand at a fast rate as people often tend to take out time to pamper themselves and use quality products and therefore go to salons and spas that care for the safety and comfort of customers. Most aestheticians and cosmetologists are licensed to perform waxing. At a salon, customers can be at peace knowing that the waxing is being handled by a beautician with expertise. Salon services create a more luxurious experience for waxing. Based on end-user, the global hair removal wax market can be segmented into men and women. Women have dominated the global hair removal wax market. However, they are not the only ones opting for waxing to get rid of unwanted body hair. More and more men are jumping onto the waxing trend to remove excess body hair from their chest, arms, and other areas of the body to achieve smooth and hair-free skin. Waxing for many men has also become part of their maintenance routine. Men who are very athletic, bodybuilding enthusiasts, and professional bodybuilders and anyone who wants to maintain smooth, hair-free skin can benefit from waxing. In terms of distribution channel, the market can be categorized into online and offline channels. Offline sales are expected to grow at a slower pace as they are affected by the increasing online sales. The online segment is anticipated to expand at a rapid pace owing to technological advancements and innovations. Social media also boosts online sales as consumers often rely on the Internet for learning about new trends and products that decide their buying behavior. 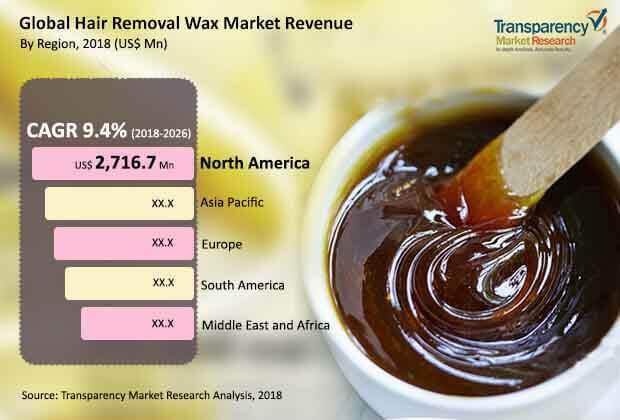 Based on geography, the hair removal wax market can be segmented into North America, Europe, Asia Pacific (APAC), Middle East & Africa (MEA), and South America. North America dominated the market in terms of revenue in 2017, followed by Europe. With a rise in population, the market in Asia Pacific is anticipated to expand at a rapid pace. China and India, followed by Japan are leading the hair removal wax market due to high inclination of consumers toward hairless body fashion trends. Demand for depilatory products is rising owing to factors such as increase in grooming, personal hygiene, and fashion consciousness among women. Some of the major players operating in the hair removal wax market are American International Industries, Church & Dwight Co., Inc. (Nair), Coloris Cosmetics, FILO BIANCO S.r.l., GiGi, Harley Wax, Jax Wax Australia, Karaver, Kera-Ban Wax Products, Lee-Chem Laboratories (Mandy’s), Marzena BodyCare, Inc., Parissa Laboratories Inc., Perron Rigot, Reckitt Benckiser (Veet), Sally Hansen, Starpil Wax Co., Sue Ismiel and Daughters (Nad's), The Darent Wax Company Ltd., and Xanitalia. The hair removal waxmarket report provides analysis for the period 2016–2026, wherein 2018 to 2026 is the forecast period and 2017 is the base year. The report covers all the major trends and drivers playing a key role in the growth of the hair removal wax market over the forecast period. It also highlights the drivers, restraints, and opportunities expected to influence the market’s growth during the said period. The study provides a holistic perspective on the market’s growth throughout the above mentioned forecast period in terms of revenue (in US$ Mn) and Volume (Mn Units), across different geographies, including North America, Europe, Asia Pacific, Middle East & Africa, and South America. Based on type, the hair removal waxmarket is segmented into soft wax and hard wax. In addition, soft wax type is segmented into heated, cold, and pre-made strips. Based on application, the hair removal wax market has been segmented into individual and commercial. Commercial segment is further bifurcated into spa and beauty salon. In terms of end user, the global hair removal wax market is fragmented into men and women. Furthermore, the market is bifurcated on the basis of distribution channel into online and offline. Geographically, the global hair removal waxmarket has been fragmented into North America, Europe, Asia Pacific, Middle East & Africa, and South America. The market has been analyzed in (USD million) in terms of revenue and (Mn Units) in terms of volume as well as the CAGR for the forecast period 2018 to 2026. The report also highlights the competitive landscape of the hair removal wax market, thereby positioning all the major players according to their geographic presence and recent key developments. The comprehensive hair removal waxmarket estimates are the result of our in-depth secondary research, primary interviews, and in-house expert panel reviews. These market estimates have been analyzed by taking into account the impact of different political, social, economic, technological, and legal factors along with the current market dynamics affecting the hair removal waxmarket growth.